The day after teaching the chocolate workshop, I woke up early & checked out of the hotel. My Eurostar train back to London was at 18:15 that evening, which meant that I had something like 10 hours to explore Paris. The early morning métro was super busy with commuters walking super fast, especially at Gare Saint-Lazare (large terminus railway station) where I changed lines. – Is it my imagination or does the Parisians walk much faster than the Brits? Is that the secret to maintaining their trim figure I wonder…? Another reason why I chose Carette is because it overlooks the iconic Eiffel Tower & I quite liked the idea of starting my Paris trip near it. ~ It seemed fitting! With only a minute’s walk from the pâtisserie to Trocadéro plaza, you get a fantastic view of the Tower that is across the river. A couple asked if I could take their photo, which I did. Then they offered to take mine on my iphone too. Pose~! (the photo is at the top of this article.) Ah, before you mention it, there were several police guards patrolling the plaza which made the place feel safe (& the couple looked like nice people anyway). 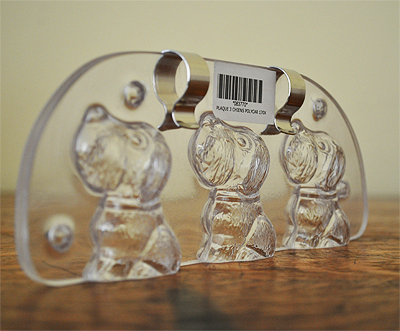 Amongst my purchase of a piping tip, cake tin & chocolate scraper, I bought this 3 doggy polycarbonate chocolate mould for 41 euros. 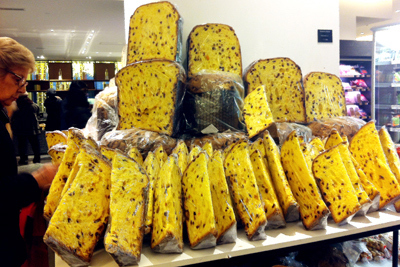 Imagine…, white, milk & dark chocolate dogs… Or even strawberry or caramel colour/ flavour…, lining them up like soldiers. The chocolate figure could be solid or it could be hollow like an Easter egg. 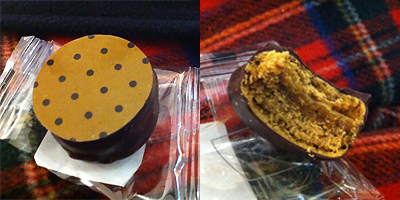 I could even stuff it with ganache like a bonbon! Or…, ah! What about shoving a strip of paper with a message in the hollow figure, just like a fortune cookie?! That might be quite cute…! – Possibilities, possibilities…!! 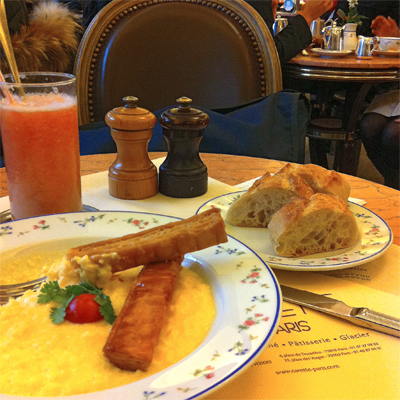 After this, I hurried to the Rose Bakery in 9th Arrondissement to meet… guess who?! Clotilde from Chocolate & Zucchini! Yup, I asked her out for lunch! Yayyy, after all these years, I finally got to meet her! Super exciting! And it was so absolutely lovely chatting with her. There was so much to talk about!! It was non-stop! Lol. In a strange way, it felt like we’ve met before, because we knew so much about each other through our blogs & also through the email exchanges over many years, ever since she mentioned me on her brownie recipe back in 2009. (I also wrote a guest article on her blog last April too) ^^. After Rose Bakery, my Paris food pilgrimage continued on with my travel bag with chocolate-work equipments from the workshop the day before, & the new purchases from MORA & marrons glacés from G.Detou, plus a signed book from Clotilde that she gave to me (it’s her new French Market one, which now I have two copies of, since I owned one already! By the way, I’ve tried several of her recipes from it & I can vouch for the book! ^^). 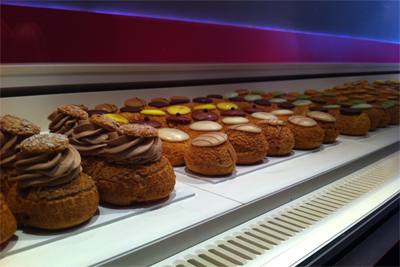 Conveniently on the same street as the Rose Bakery, there is Popelini, a choux à la crème (cream puff) shop. It is a cake shop that was on my list of ‘want to go’ places. 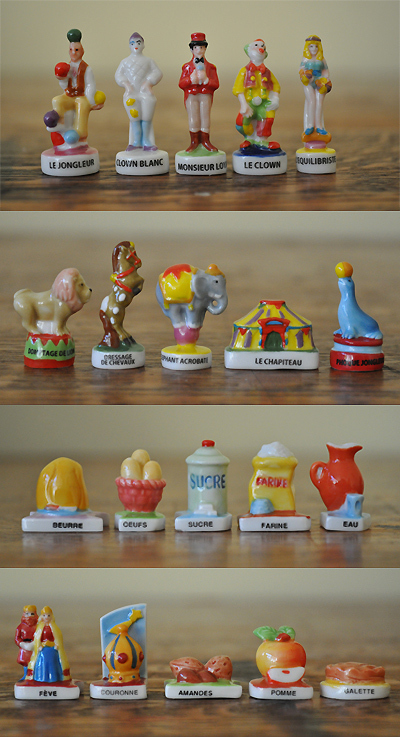 Resisting the urge to say: “May I have one of every kind you have, s’il vous plait?”, I picked out the one that is on the left of the picture below. Well, it had the most cream on it didn’t it?! Lol! Happy to report, it was delicious. Wicked in sizing.- Moreishly small, & dainty in a hip sort of way. 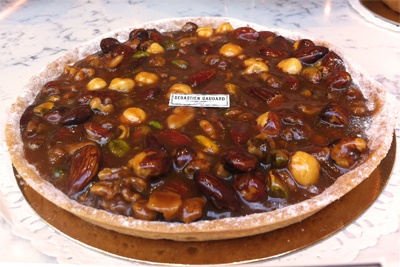 Two to three minutes stroll down the same street toward the Notre-Dame-de-Lorette station, is another great cake outlet – Patisserie Sébastien Gaudard. I purchased a mini Le Paris Brest, it’s circular shape representative of a wheel to commemorate the Paris to Brest bicycle race. 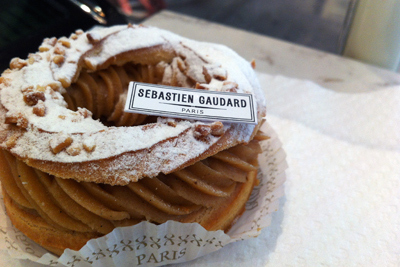 It is choux pastry cut horizontally piped with praline cream inside. So pretty… And so perfectly made. Respect. And what is it about these small card plaquettes that make a pastry look so darn special! It sure adds the value-factor don’t cha think?? Although…, from a seller’s point-of-view, I guess it only works when you’re a high-end (& well-known) establishment that people want to parade perhaps? – Like, it’ll totally work to its disadvantage if the establishment were a Lidl (discount supermarket)…, for want of an example. One would be foolish to take around a pack of Lidl branded cakes if in need to up your game to impress. After this, I managed to go to another ‘must-go’ destination on my list. La pâtisserie des rêves par Philippe Conticini near Rue du Bac station in the 7th Arrondissement. I bought the lemon tart that has a ingeniously created meringue top. I knew about it from watching his website video sometime ago! – By the way, I recently heard that La pâtisserie des rêves is opening its London branch this February! Yayyy! Me says I-Can’t-Wait. 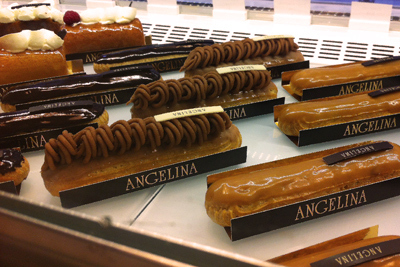 Walking down the same street going south, I found the famous Angelina on the opposite side. It is their new outlet which is take-away only, no tea room. Happily surprised, I, quite naturally, walked in & bought their famous Mont Blanc (6.70 euro) Y’know, to sample ofcourse…, for research… cough cough. This Mont Blanc was consumed in the Eurostar, half way inbetween France & England. Yet again, happy to report that this was also amazing. I’m so glad I bought it. I also don’t know of anywhere that sells Mont Blancs here in London, other than in Laduree in Harrods, & I’m never down that end of town. For me, it’s intriguing to sample good cakes, especially those that are their signature ones, to see what’s so winning about it (or, I sometimes pick out the most obscure item on the menu if it sounded unfamiliar.). – Eating them is like deciphering like a detective, I taste each component separately first, then eat it as a whole to see how it unites. Oh, it’s super fun! Angelina’s Mont Blanc is simply a thin sweet-meringue base, mountain of lightly sweetened chantilly, & chestnut cream beautifully piped on it. The chestnut cream was really special. Flavorsome, not too sweet, & also very dense. A lot denser than I thought actually, which by the end, really filled me up. I imagined eating this with their famed hot chocolate in their famed tea room. I reckoned it’ll be too much for me. Though, then again, I guess you’d be spending a long time in the tea room, taking time to eat & drink, soaking in the grand atmosphere…? 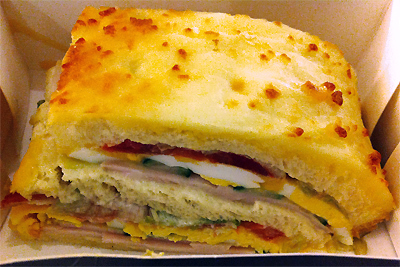 Thinking ahead to supper-time on the Eurostar heading home, I bought a slice of ‘Le Croque Classic’. An indulgent double-decker sandwich made of bread, turkey, pancetta, cheddar, tomato, cucumber, hard boiled egg, iceberg salad, mayonnaise & worcestershire sauce. 5.90 euros. Not sure why it’s called ‘classic’ (I would’ve thought croque is more like croque monsieur with ham & cheese only? I might be wrong though! ^^), but it was worth every penny & went down well. I deliberately left pâtisserie Sadaharu Aoki for my final destination before boarding the Eurostar as I knew I would be buying the most cakes there. 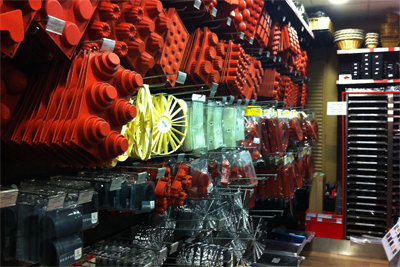 Thinking, oh yeah, I can walk from La Grande Épicerie to his shop on Rue de Vaugirard no problem – wrong. Gah, I was lost. It seemed simple enough on the map, but somehow I walked around a block twice. Not what you want to do when your bag is digging in to the shoulders. Nevertheless, I trudged on, only because I’m not in Paris so often am I & if I missed going there now, the next time will probably be way away in the future. Luckily though, after about a troubled 15 minute “Oh dear I’m lost” moment (which felt like at least double its time), I found the pâtisserie. 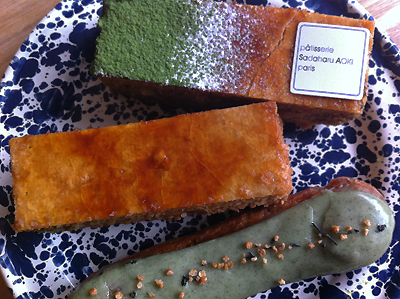 I bought these 3 items: Genmai-cha (Japanese roasted tea) eclair, millefeuille with vanilla crème pâtissière & another of those in green tea version. That surely counts as one of the best uses of 10 hours I can think of! :) So glad you had such a great time and that you got to meet Clotilde! 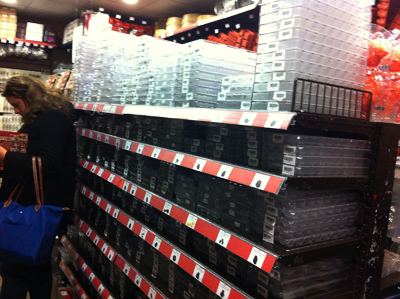 I love Mora too, I justify any money spent there with the knowledge that whatever I buy is probably cheaper there than it would be in the UK (or States – I once bought myself a set of silicone financier moulds, went back to the States and discovered that the same thing cost four times more there… I kid you not). Thank you for this fantastic report! So happy to read that you enjoyed your time in Paris and made the most of your trip the way you had exactly planned!! Looking forward to welcoming you again or seeing you in London. Happy new year!!! 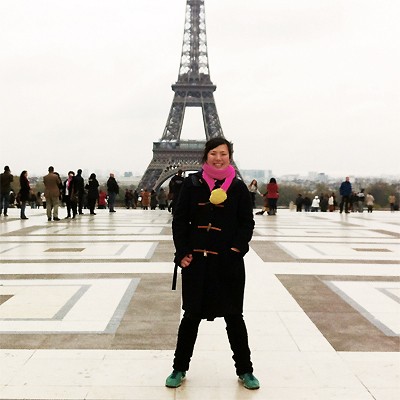 Yes, the following day went almost as planned minus I didn’t get to climb the Eiffel Tower like I told you – Seeing so many tourists near it by the Trocadero plaza made me think that it’ll take up too much of my time to queue & stuff – it changed my mind…!! Maybe next time when I have more time… – Anyway, hope to see you in Ldn one day also! Happy new year to you & your lovely family!!! I LOVE the feves! It looks like you really had an amazing time, good for you.. you deserved it! Now that you’ve made me feeling hungry, I’m off to fix dinner. No eclairs for dessert, though. Boo. – Anyway, thank you for always checking on my blog! As you are surely aware, I am inconsistent in regularly updating it…!! The longest I’ve left it was FOUR months!!! Shame on me…!